This is an old item. Home Deport phased out most uses of neonicotinoids in 2016 and all uses by 2018. Green House magazine also covered this story. Note how this propaganda poster has no date associated with it – but says “Important!! I saw this at Home Deport yesterday!” Note also that in spite of a photo of a tag at allegedly at Home Deport, the poster has misspelled “neoniconoids”. Even after I posted links to the Home Depot press release and media coverage pointing out this was not true, several more people piled to the Facebook comments saying they won’t shop at Home Depot. Sigh. Great illustration of how it is essentially impossible to correct an incorrect propaganda message. This appears to have originated back in about 2012 when some studies found an association between neonicotinoid usage and bee deaths. Looking through Scholar.Google.com for updated information, it appears the relationship between neonicotinoid usage and bee colony collapse disorder may be more complex than originally thought back in 2012; some studies now report colony collapse may have been due to tiny mites and that earlier studies on neonicotinoid did not take into account the “dosage” of neonicotinoid actually passed on to bees through pollen. Important!! I saw this at Home Deport yesterday! Do not, I repeat, do not buy plants treated with neoniconoids. Bees take the pollen back to the hive and feed it to the brood. This is the number one cause of colony collapse! Necniconoids are banned in Europe! Please! 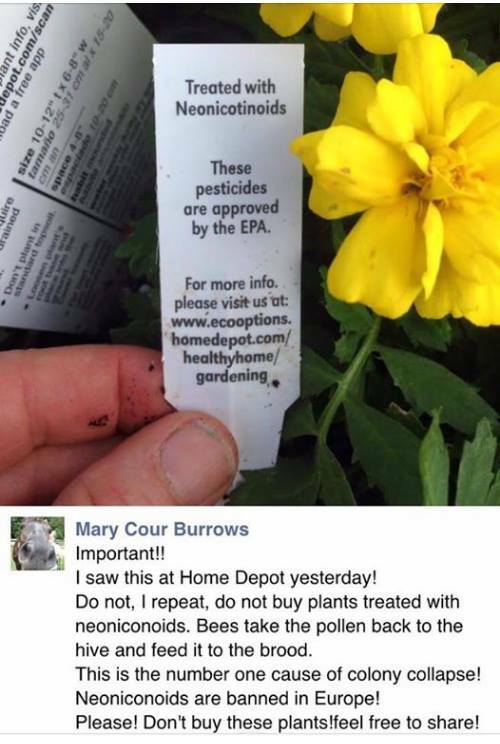 Don’t buy these plants!feel free to share!